An expression "T()" which creates a value-initialized rvalue of type T, which is a non-class type. Definition at line 1942 of file ExprCXX.h. 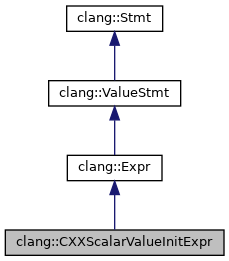 Create an explicitly-written scalar-value initialization expression. Definition at line 1950 of file ExprCXX.h. Definition at line 1959 of file ExprCXX.h. Definition at line 1978 of file ExprCXX.h. Definition at line 1982 of file ExprCXX.h. Definition at line 1973 of file ExprCXX.h. Definition at line 91 of file ExprCXX.cpp. References clang::Expr::containsUnexpandedParameterPack(), clang::Type::containsUnexpandedParameterPack(), clang::Stmt::CXXNewExprBits, clang::Expr::Expr(), clang::Stmt::ExprBits, clang::SourceRange::getEnd(), clang::CallExpr::getRParenLoc(), clang::CXXOperatorCallExpr::getSourceRange(), clang::if(), clang::Type::isDependentType(), clang::Expr::isInstantiationDependent(), clang::Type::isInstantiationDependentType(), clang::SourceRange::isValid(), clang::ListInit, clang::NoInit, clang::OK_Ordinary, clang::SourceRange::setEnd(), and clang::VK_RValue. Definition at line 1971 of file ExprCXX.h. Definition at line 1966 of file ExprCXX.h. Referenced by clang::TreeTransform< Derived >::TransformCXXNamedCastExpr(), and clang::ASTNodeImporter::VisitCXXScalarValueInitExpr(). Definition at line 1962 of file ExprCXX.h. Referenced by isImplicitThis(), clang::TreeTransform< Derived >::TransformCXXNamedCastExpr(), and clang::ASTNodeImporter::VisitCXXScalarValueInitExpr(). Definition at line 1943 of file ExprCXX.h.